Anna Lisa Somera is a life science professional, marathoner and triathlete. She holds a MPH and MBA from the University of Illinois at Chicago and a MS in anatomy and cell biology from Rush University. She has been published in peer reviewed medical journals and helped drive the formation of several life science start-ups. Melanin is a natural pigment that gives people their skin color. If too much melanin is produced in one area, hyperpigmentation or a “brown spot” can occur. Brown spots can be flat or raised, round or oval, and can appear anywhere on the skin, alone or in groups. 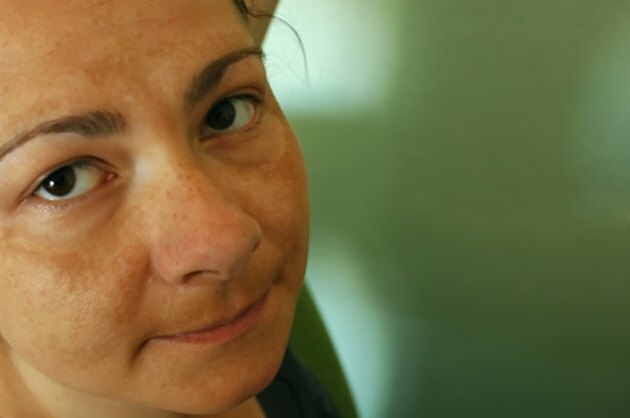 Common brown spots include freckles, moles and age spots. While usually harmless, brown spots can cause concern when they suddenly become itchy. Identifying the cause of the itch is important. Prolonged itching can not only lead to lack of sleep and fatigue, but it could signal worsening of a condition that can be better treated if caught early. Various types of itchy brown spots exist. Some are round and raised as seen in seborrheic keratoses (SKs) and dermatofibromas; others, such as tinea versicolor, are flat. Some spots can have a patchy appearance such as lichen planus; others, such as age spots or melanomas, can have irregular borders. Location on the body also helps classify spots. Some favor oily areas such as the upper back or chest, while others tend to occur in more distal areas such as wrists and ankles. Knowing the cause of brown spots is important because some cannot be ignored and are dangerous if left untreated. Spots can appear for a variety of reasons. They can be due to excessive sun exposure, aging, genetics, hormones, fungi or disease. Sometimes the cause is unknown. Some persistently itchy brown spots, such as melanomas, can be deadly. Melanoma is a serious form of skin cancer that can spread to almost any organ in the body, especially the brain, lungs, liver and bones. The first signs of melanoma are often a change in the shape, size, color or texture of an existing mole or the development of a new, strange-looking one. Unusual characteristics of moles that may indicate melanoma include an asymmetrical shape, irregular border, uneven distribution of color and a large diameter. The type of brown spot determines the course of treatment. Some require surgery while others simply need an over-the-counter (OTC) cream. Benign spots such as SKs can be surgically removed using cryotherapy (freezing), curettage (scraping) or electrosurgery (burning). Those that are caused by a fungus, as in the case of tinea versicolor, can be treated with OTC anti-fungal creams such as clotrimazole and miconazole. Spots where self-treatments do not exist, as in the case of lichen planus, require prescription-based steroids (topical or oral). More dangerous spots such as melanoma require more attention. If caught early, the growth can be removed by surgery alone or in combination with a sentinel lymph-node biopsy. Widespread, late-stage melanoma treatments vary based on a patient’s conditions and may include surgery, chemotherapy and radiation treatment. Most brown spots are more of a cosmetic nuisance than they are dangerous. For instance, the tinea versicolor fungus is not contagious, and dermatofibromas are not cancerous. For the spots that are dangerous, however, the prognosis is usually very good in its beginning and middle stages. To play an active role in preventing spots from becoming worse, examine all areas of the skin monthly for spots that are growing, changing or itching. It is advisable to see a physician before attempting to treat or remove brown spot by yourself.